What are Some Options for Flexible Packaging? Flexible packaging, or packaging that uses a flexible substrate called “film” to make bags, pouches, sachets and other pliable shaped containers is the fastest growing segment in the packaging industry today. This is due to its relatively low cost versus other packaging containers, greater convenience (e.g. zipper pouches) and excellent oxygen and moisture barrier qualities. Flexible packaging can be used for food products, personal care products such as shampoos and creams, liquid products, dry products such as powders and various other chemical and industrial products. 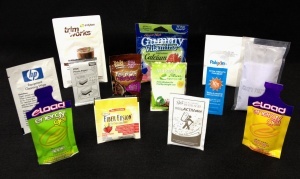 A sachet or packet is a common style of flexible package frequently used for samples or single use applications. Poly bags can be used for a variety of applications including packaging for small items such as nuts, bolts and screws and other similar items. Various types of films are available for flexible packaging. Most packaging equipment uses structured film. Structured film has 2 or more layers of material that are laminated together. The film properties and characteristics, including tear resistant characteristics and barrier properties are determined by the type of materials used in each layer. Polyethylene (PE), polypropylene (PP) and polyethylene terephthalate (PET) are materials commonly used in structured films. Film can be printed using a flexographic or rotogravure process. Some films are “reverse printed” meaning that the outer film layer is printed on the inside before it is laminated to another layer, in effect trapping the ink between 2 layers and making the print indelible. The most common type of equipment used for flexible packaging is Form, Fill and Seal (FFS) equipment. This equipment utilizes laminated roll stock film. The bag, pouch or sachet is formed and then filled in a single process. On some machines, the process moves horizontally (HFFS) and on other machines, the process moves vertically (VFFS). Liquids are typically filled using a pump, an auger is used for filling powders and “scales” or buckets are used for filling other items such as dried fruits and nuts. In some cases, film is converted into pre-made bags which are then used for filling at a later time. Pre-made bags can be filled manually, semi-automatically using a volumetric filler or automatically. There are many other styles and benefits of flexible packaging. Overwrapping is a type of flexible packaging using clear or printed film to package small items such as plastic forks and spoons or printed items such as trading cards. Some packaging equipment uses film which is formed into tubes and supplied on a roll. The machine seals the tube at the bottom, the product is then inserted either manually or automatically, and the tube is sealed at the top. This style of flexible packaging is commonly used to package small or low cost items such hardware.